Non-profit collaborations have been a means for organizations to accomplish similar goals in a big way! The boost gained from such short term or long term collaborations can increase the overall efficiency and community outreach efforts, an organization intends to reach. Our efforts to collaborate with other entities who share the same passion, vision, and purpose as we do, is one of the ways we create a strong positive social impact. With our B The Light program, our core mission to provide access to the highest-quality leadership development experiences in order to empower the next generation of local and global leaders. 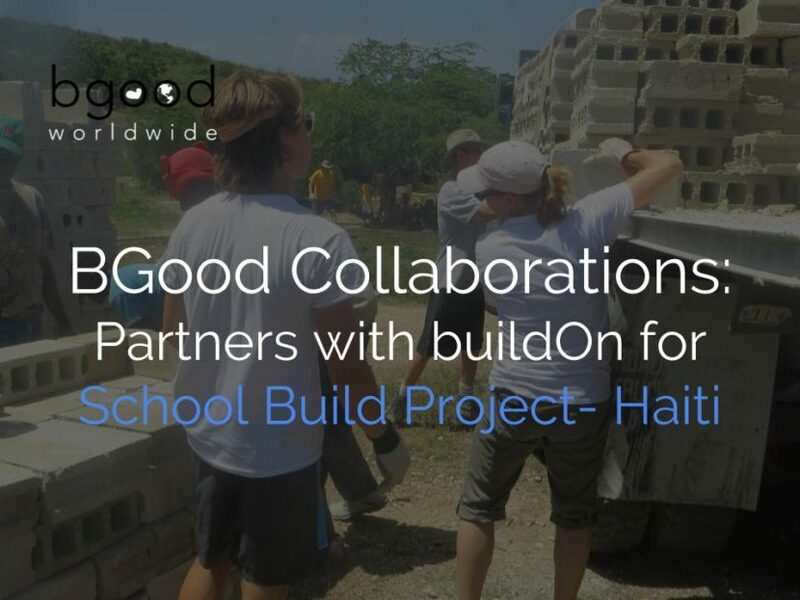 To support our mission, BGood Worldwide’s first step has been to partner buildOn, a nonprofit organization who works to combat the cycle of poverty, illiteracy, and low expectations through global service and education. Through the engagement of participants in groups, The School-Build Haiti Project efforts will result in the construction of one primary school in Haiti. This school will serve over 400 children and adults from a rural community; acting as a catalyst for sustainable and positive community development. This collaborative project is open to a variety of participants who seeks to 1) receive mentoring and a leadership development guidance, 2) to engage in their local community, and 3) to use their acquired resources in a global group service trip to build a school in Haiti. This spring, we will begin recruiting students from Nyack College to participate along with participants in our B the Light programs. We encourage individuals who seek to make a positive impact on their communities to get involved! Nyack College is an educational institution well known for being diverse and creating ‘difference makers’ ready to take on the world. Focusing on five core values (academic excellence, global engagement, diversity, personal transformation, and social relevance), Nyack College has been able to integrate faith-based and spiritual learning into a community of mentorship culture amongst faculty and students. They strive to produce community and global leaders who seek change and are divergent in their efforts to produce that change. We know the journey to completing the construction of the school in Haiti starts well before breaking ground in the winter/spring of 2020. There is personal development and academic growth to be done along the way. That’s why our project begins in the spring of 2019. During that time all team participants will receive 30 minutes of online mentoring and a leadership education course each week. Our curriculum focuses on skill-building in four content areas; communication, problem-solving, technology, and resource-acquisition. Participants will also complete a 1 hour a week local community service effort in their surrounding areas to apply the skills gained from the leadership development curriculum. We believe the combination of leadership development and local community service offers participants consistent support to development their unique leadership skills while also giving them an opportunity through The School-Build Haiti Project mission trip, to use those skills directly in a global community. Our hope is that by partnering with variouys college and univerisity student such as Nyack College students, our project will make a positive impact for not only our participants, but the local community in which they will complete community service efforts, and the Haitian community that will benefit from the construction of a primary school. buildOn: buildOn U.S. and Global work to combat the cycle of poverty, illiteracy, and low expectations through global service and education. Their program tackles critical issues within their surrounding communities, contributing services, and taking an ongoing commitment to immerse participants in a cultural experience. buildOn puts an emphasis on leadership and team building by engaging students in dynamic cultural workshops, deep reflection activities and thorough explorations of issues facing their host community. To learn more about the great accomplishments of our partner buildOn, please visit their website at www.buildon.org . This project and partnership is made possible by the generous contribution by a grant, from the Ellis L. Phillips Foundation and knowing ‘what needs to be done’. Ellis L. Phillips Foundation: The Ellis L. Phillips Foundation is a small family foundation dedicated to the ideals of Kathryn and Ellis Phillips, to identify “what needs to be done” and provide strategic investments in projects that serve as catalysts for the greater good. Their grants aim to make a sustainable contribution to charities and organizations, in which they have special knowledge and interest. As collaborators, the foundation makes investments in various industries such as environmental, human services, visual and music, historic preservation, philanthropy, and foundation- initiated projects. Simply put, community engagement is an initiative by its members to create a positive social change. It is the partnership between members of the community through their involvement with the planning and decision-making processes. They can express their opinions and exchange new information that would be helpful to others. This engagement is very hands-on ranging from community council meetings, parent involvement with academic initiatives, youth organization events and programs; as well as environmental initiatives. Since, the idea of a ‘community’ is inclusive of all members, their engagement provides perspective. If ones opinion differ from popular opinion, creating a balanced understanding through conversation can add layers to the decision-making process. With developing communities, it is important to encourage and educate the next generation. Allowing younger members the opportunity to voice their opinions and share new information, tends to offer a new perspective that may have been previously overlooked. Most often, we look to our youth as the leaders of tomorrow. They are members of our communities who actively participate, explore, and engage in its development. 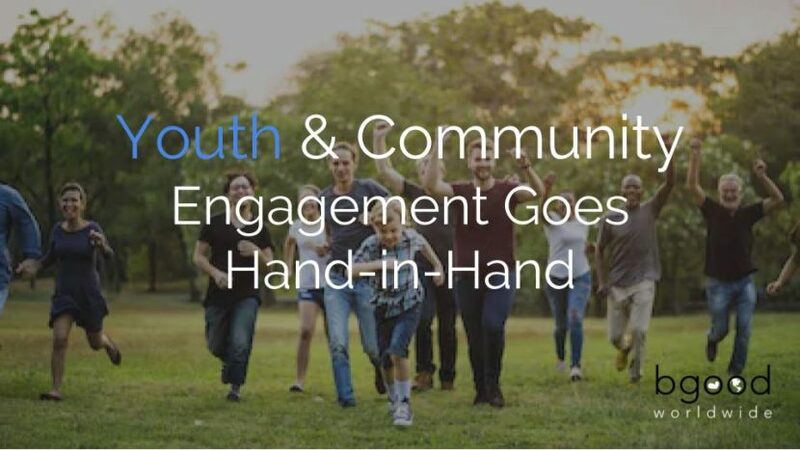 Dedicating their time and talents to produce a positive impact is a fundamental pillar of what defines youth community engagement. Their involvement provides a space to recognize their personal abilities by helping improve upon the conditions and challenges that directly impact their everyday lives. It can also increase the amount of empowerment for themselves and members of their community. To keep up their desire to be involved in their communities, youth need to be educated by methods not commonly found in a classroom. By using programs, technologies, and focusing on topics young people hold a passion for, the youth can become more aware of the issues affecting their community. Taking advantage of communication tools such as social media platforms, will allow them to be more hands-on with bringing awareness to the community cause. Youth are more likely to be involved in fundraising initiatives such as sport tournaments, selling desserts and beverages, or creative arts showcases. These initiatives create the opportunity for youth to be able to showcase their unique abilities and use their social medias to share this information with peers from other communities. Empowering youth to be a valuable part of the discussion is another great way to get them engaged in the community. They would be more likely to provide their input if they feel it will be a valuable contribution to the discussion. Not only do they gain a stronger sense of self-efficacy and confidence, but they also build stronger connections through their sense of belonging and relationship built with older members. With information be shared and relationships being built, community members are building lasting traditions that can be practiced long term. For example, community sweep days, clothing or food drives, holiday sports tournaments, summer cooking parties, and various other ideas can help strengthen the connection and pride community members share. Having youth and adults working together to produce meaningful results for the community is what a true community is all about. If you are considering making an impact in a positive way in your local community, establishing a partnership with other members of your community is a chance for you to co lead instead of sitting quietly to the side, as well as further engage by providing frequent and thoughtful contributions. We know that an amazing adventure awaits you when exploring the unknown. When you know what your purpose is and what you can provide to the world on your journey. Even if you know where you would like to go or even if you have no idea, we can start by helping to navigate the ins-and -outs the best version of yourself. Currently, the market is filled with various educational materials on leadership. BGood Worldwide’s B The Light program curriculum will use Google Suite for Education to compile a comprehensive curriculum to teach leadership through various mediums. 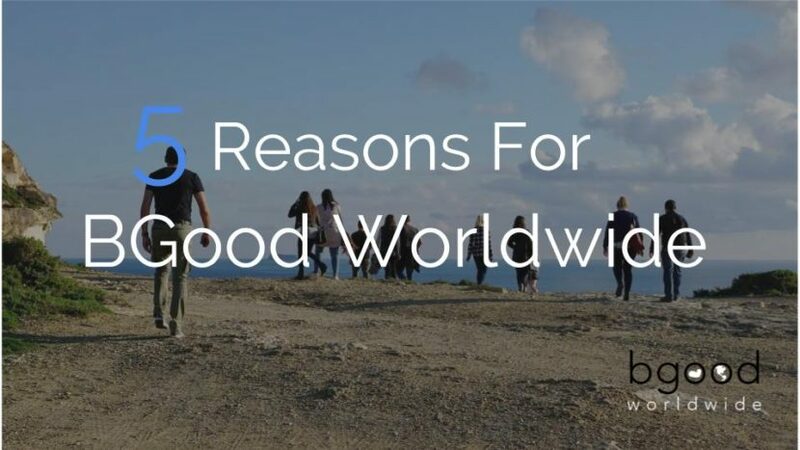 It will track five main themes that constitute the foundation of BGood Worldwide’s mission: Integrity, Friendship, Dreams, Forgiveness, and Honor. BGood believes these fundamentals are critical for any community leader. Using an online platform as an educational tool allows participants to constantly have access to the curriculum materials at all times. It creates a space for discussions to be documented, participants can review and critically responds without missing a beat. The online platform will use interactive video, imagery and writings to push the boundaries of leadership education. The curriculum will also require participants to upload their own content to personalize the experience and create strong bonds with their fellow teammates. BGood will evaluate the curriculum yearly to ensure that the content remains up to date in addressing certain pressing current issues. As a result, each lesson will use these themes to highlight important concepts and teach the best practices for how to maximize each participant’s leadership abilities. Our curriculum will be designed to be both challenging and rewarding to participants of all backgrounds. 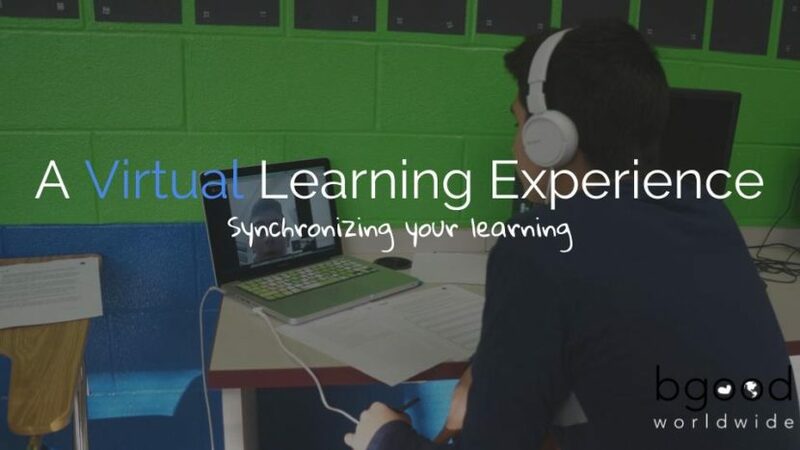 Uniquely designed to utilize a virtual space, we have combined online leadership mentoring and education delivered through applications which allows participants to engage in their leadership education anywhere, anytime. Specifically, using Google Suite products such as Gmail, Hangout, Blogger, Youtube, Calendar, Drive and more, as the communication hub, are powerful and easy-to-use tools available across access all mobile, tablet and laptop devices. Team members receive interactive leadership workbooks that lessons and assignments with rich video, imagery and writings about leadership concepts. Each workbook enables team members to load personalized text, pictures, and video to fully customize each team members’ experience. The workbooks are completed independently and should take each team member approximately one hour per week. Each team will be assigned a team leader, who would utilize Hangout, Google’s video chat and messaging tool, to connect with each team member for approximately thirty minutes per week to help support the team members throughout the program. Our day-to-day habits can be hard to build and break. Being young allows us to try and understand what is interesting yet beneficial for us. Whether you dedicate just a few moments a day or a few hours a day for your own self-development, you are setting the tone needed to produce productivity and creativity. Start by planning your day the night before. Leadership is about having a vision. And developing a vision requires a plan of action. Good leadership skills are essential to advancing your individual development, but leadership is much more than simply being in charge. If you can effectively translate your vision enough to inspire others, this is setting the example. Having an idea of what you would like to get done in a set a framework for smooth functionality. Be sure that the task and strategies you have come up with, contribute to your vision both long term and short term. Make these strategies realistic and measurable so you can monitor your progress. Then, time for sleep! Getting proper rest is key to revitalizing the body and mind. You want to be able to tackle the day full of energy, with a great attitude. A good night’s’ rest should consist of at least 8 to 10 hours of sleep. After getting your proper rest, rise up early enough to ‘get the worm’. 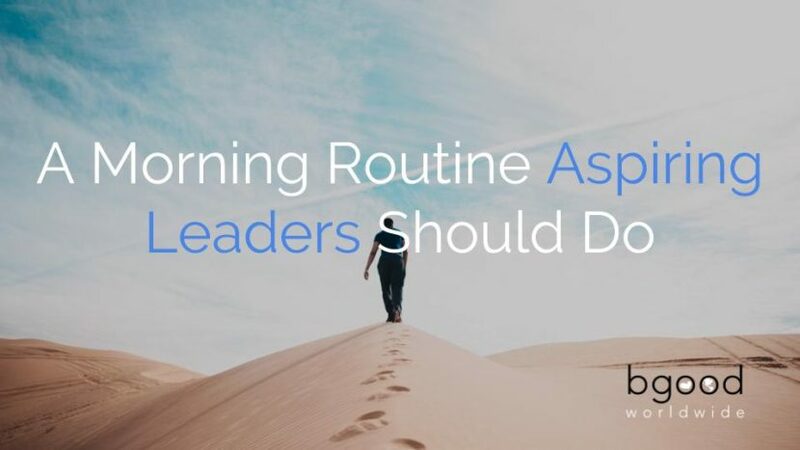 One of the ways to succeed in getting the best possible start to winning your day-to-day is by setting rituals or routines so you can avoid the scrambling of putting together a to-do list. If you can make such routine more of a habit, you can create a positive momentum of proactive behavior. There are numerous studies that link individuals who begin their day in the early morning hours to more positive traits such as being proactive, having better attitudes, more likely to be kind to others, and tend to be smarter. An early start creates time for self-development. It provides more time for reading, meditation, prayer, recollection, making a nutritious breakfast, even getting some exercise. Including a means of higher learning, health, or creativity at the beginning of the day, redirects your energy into being more doing rather than reacting. While in this momentum of ‘doing’, completing small tasks such as making your bed is a success habit of ‘getting things done’; followed by feeding your second brain, the stomach. After waking up, drink glass of water, orange juice, or apple juice to help replenish and awaken your body, activating your nerve cells for the day. Once you are awakened, you should take at least 10 to 15 minutes for mindfulness. Mediation, reading or writing are great ways to center and focus your mind and energy on producing a clear space for the day. This also helps to relieve the excess tension that might have remained after getting your 8 to 10 hours of sleep. With a refreshing start to your day, you are now in a more positive space to begin your day. It is important to carry a positive, can-do attitude during your daily interactions. Others can gain a sense of inspiration simply by way of conversation or working alongside of you. The best way to strengthen these interactions is through more communication. Getting the opportunity to build relationships with your family, peers, or colleagues to learn more about what their interests or concerns are, creates conversation full of depth and meaning. For any individual, active listening is a great trait to build upon. Someone who listens to suggestions, ideas, and feedback from other people, and provides the same for others in return, it all about building advancing in your self development as well as aiding in someone else’s self development. Another thing that individuals naturally do is learn. Engaging in your surroundings by taking in the knowledge of everything you experience from your day, can be shared with your peers and members of your community. Learning is one of the major keys to success! It keeps your mind sharp, and your skills fresh. It prepares you for new challenges that may come your way. In leadership, this is someone who can see learn from an obstacle and see the bigger picture enough to later anticipate problems before they occur. This is a valuable skill to have when handling complex problems. The ability to foresee and provide suggestions for avoiding potential problems also helps you recognize opportunities that others overlook, which will certainly aid in your self-development. A great way to reflect upon your day is to dedicate more time to mindfulness, specifically sitting in silence or journaling the events of the day. Reflection helps you to discern the value of your day, whether your behaviors, energy, focus were enough to contribute to your vision. Everything you do acts as a building block to how you intend to become what you have envisioned for yourself. By following these daily habits you can take the grunt work out of you self development journey and focus on the real work to achieve your vision. Since the beginning of humanity exploring the unknown has been one of the storylines we’ve consistently played throughout all of history. To explore the unknown means to uncover truths and undiscovered worlds; embracing the fascinating nooks and crannies of these divine world to feed our indulging minds. It offers inspiration, encouragement, and motivation to continue further into the depths seeking new possibilities for things we have we have always known. But what happens after our explorations have come to an end? What happens with all the acquired knowledge? Simple, we share it with others! The best things in life are better when you can share it with your family, friends, and peers. It gets even better when we can participate together. When knowledge is shared amongst members of a community, we create a means to spark new conversations. From these conversations, we establish new concepts and ideas. Sparking the conversation, this how leaders are inspired. Leaders transform the world by creating new productive and creative pathways to learning. It involves the development of your personal qualities, family support, and your philanthropic qualities. Take athletics for example; to be a well-rounded athlete we must train hard, most often using various training methods. This concept is called cross-training. A swimmer will cycle, run, and lift weights to improve their skills in order to become a better swimmer. For the leaders of tomorrow, learning, sharing, and participating are the cross-training mechanisms needed to become a better leader. This is what BGood Worldwide encourages! Our B The Light leadership program is designed specifically to help uncover your leadership capabilities, perform work in various communities, and getting involved with those in your connected circles. The results of your participation can be extremely fulfilling in terms of gaining new skills, networking, and a variety of other aspects. You can gain and discover new skills. Interactive learning and opportunities to support a worldly cause can give individuals access to untapped potential. You can discover skills that are transferable to aspects of everyday living. Skills such as building a presentation presence, time management, organization, teamwork, problem-solving, and creative thinking. You can explore different career options: Understanding where your capabilities fit in on the broad spectrum of the workforce can be weeded out during this development stage. You can improve on the areas that you excel in and bridge a connection in areas in which you don’t excel. The key is determining what you are best at doing. Bringing value to your community: You never know when your new found skills can improve someone else’s quality of life. You can improve your CV: Employers value programs that target individual development as a means of industry experience. Crediting such exposure on your resume or cover letter, allows an employer to see that you have learned valuable skills from an internship, volunteer work, missionary work, or shadowing. First-hand experience can build confidence in your abilities. Responsibilities become easier the more familiar you are with the kind of work performed in your area of interest. You get a sense of motivation to say ‘this is something, I KNOW I can do’; and an employer can have a sense of confidence in considering your capabilities when considering you for a position. You can expand your network of people: I am sure we have all heard the saying” it’s not about WHAT you know, but about WHO you know, to get you where you need to go”! Taking on the opportunity to communicate with others enables you to build lasting relationships with people in various walks of life. The relationships allow you to gain new perspectives about your experiences. For example, having interests in certain career fields would benefit from internship and shadowing opportunities to get a better idea of the daily responsibilities of a professional in that field. Networking to build relationships with these professionals in such career fields gives you a better chance of helping individuals deciding on the best career option.